Slovenia's Postojna Cave is the most-visited cave complex in Europe and has welcomed nearly 200 million visitors to gape at its incredible karst formations, cavernous chambers, and interesting collection of cave animals. Stretching for 13 miles (20km), one of the best things about visiting the astounding Postojna Cave Complex is its top-class infrastructure: the cave is well-lit and visitors access the underground walkway by train. Guided tours of the cave last about 90 minutes, during which time visitors are treated to a wealth of glittering calcite formations, stalactites, and stalagmites, as well as an underground aquarium where an array of troglodyte creatures are displayed. 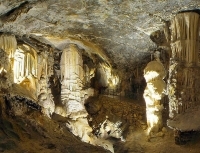 The Postpojna Cave is also home to a subterranean concert hall with celebrated acoustics and classical music performances are common (especially in the summer). One of the very best things to see in Slovenia and in the whole of central Europe, a trip to the Postojna Cave Complex is highly recommended.